As a former star with National League outfit Forest Green Rovers, Motherwell winger Elliott Frear was unsurprised at the stern test offered at Gateshead on Saturday. The side from English football’s fifth tier defeated Frear’s current employers 3-2 as they proved to be more than a match for the Scottish Premiership men in a rollercoaster pre-season friendly. “There are good players down at this level,” said Exeter-born Frear (26). “It’s not all just about hoofing the ball. “I played in the Conference (former name of the National League) for four seasons and I know what it’s like, it’s a scrap. “Some of the boys dealt well with it and others had to scrap a bit more. Most of the players at this level have a good attitude as well. “It was a difficult game for us today and obviously it was disappointing to lose. Frear didn’t think the lengthy grass on the pitch at Gateshead’s International Stadium did Motherwell any favours on Saturday. “I think the pitch was difficult for the boys,” he added. “It was a good test for us but I thought we did ok. The three goals were one ‘worldy’ and two deflections. “We are all disappointed with the three goals that we conceded. “But we couldn’t do a lot about the three of them. Saturday’s goalfest in the north east of England – and there could have been several more additions to the scoreboard – was in stark contrast to the pair of 2-0 victories ’Well recorded at Stirling Albion and Livingston in their previous two pre-season fixtures. 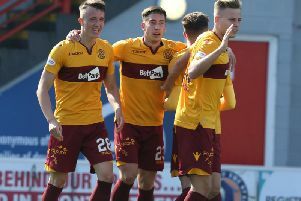 But one constant throughout the three-game campaign has been the goalscoring form of Motherwell striker Ryan Bowman who has netted three times to add to the penalty he converted at Inverness Caley on the final day of last season’s Scottish Premiership campaign. Motherwell suffered another defeat against National League opposition on Tuesday evening when they went down 1-0 in a friendly at Barrow.